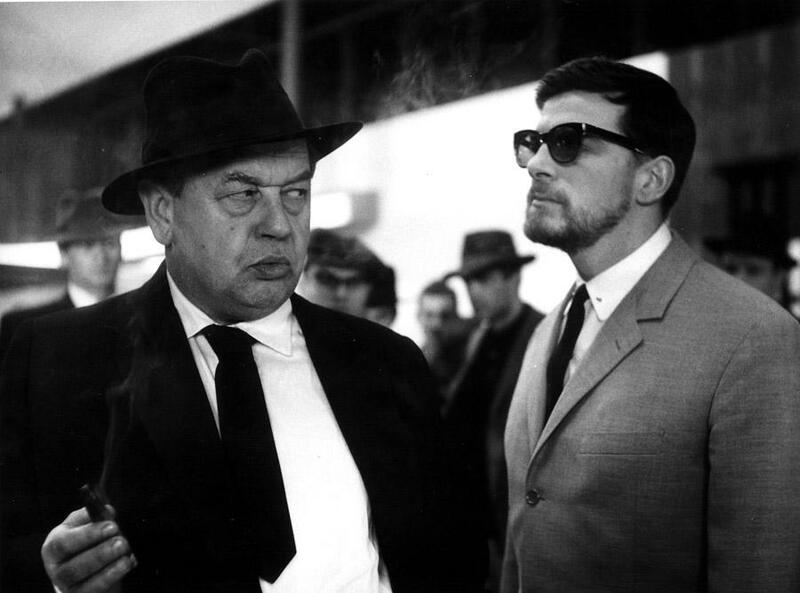 There is no doubt that the 60s was the golden age of Czechoslovakia’s cinema and this is mainly due to the Czechoslovak New Wave. Parallel to the rise of this highly artistic wave there was another FAMU originated wave that gained the attention not only locally but on international level too. The comedies and especially the Hollywood-themed parodies that emerged in that period are another characteristic of Czechoslovakia’s cinematic innovation. 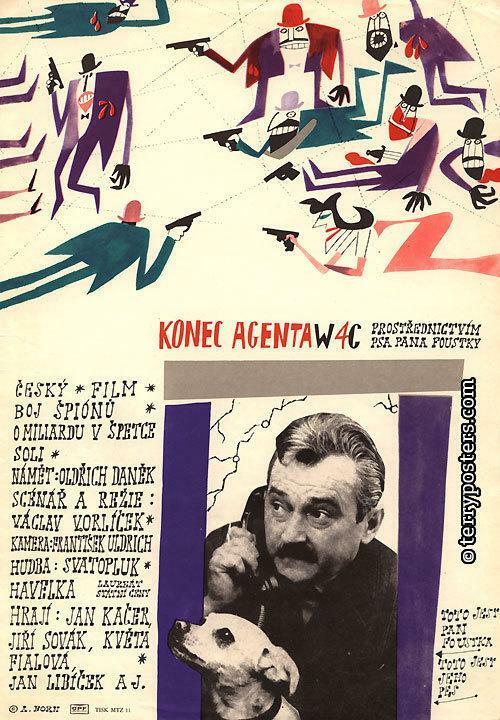 One of the main directors of this more commercial trend was Václav Vorlíček who in 1967 directed the espionage parody Konec agenta W4C prostřednictvím psa pana Foustky (The End of Agent W4C) that was based on a story written by Oldřich Daněk. Cyril Juan Borguette (Jan Kačer) is the best and most dangerous spy in the world who is working under the alias Agent W4C and must undertake another crucially important mission. He has to travel to an unnamed capital city of the Eastern Bloc (also known as Prague) in order to find some top secret military plans that no one really knows where they are hidden. The planet’s future is in his hands. He also must face any possible challenge since the city is packed with spies from all over the world for the same reason. Agent W4C is a renowned seducer and he will use his powers over the brutally beautiful Alice (Květa Fialová). Strangely his job becomes even more difficult since the middle aged accountant – spy Foustka (Jiří Sovák) and his little dog Pajda are probably too tough for him. The End of Agent W4C is a different comedy for someone who is unfamiliar with that kind of humor. Probably Václav Vorlíček and Oldřich Daněk didn’t create the expected parody that the audience of the West could imagine. The film moves in a quite subtle and demure way so it could be easily believed that this is not a comedy but a real deal of spy action film with a twist. Only after the initial adaptation to the peculiar characteristic deadpan comedic manner as it is mainly acted by Jiří Sovák and Jan Kačer it becomes perceivable that everything is so hilarious and there is nothing serious about any circumstance. The most irrational things are explained in the most severe way. Important issues like the political analysis of a possible conflict are blending with a deadly alarm clock that could cause a mini nuclear explosion. Also the top secret information has an immense value which is estimated in one billion; of course the worth is not in US dollars but in Czechoslovak korunas! The striking thing is that everyone even “behind” the Iron Curtain could also make fun of the Cold War tension that was rather present in the 60s and that they are dealing with that absurd and awkward era with even more crazy acts. That could be a common ground that was not known to the West at that time. The story by Oldřich Daněk doesn’t really need any rational explanation. An atypical bureaucratic anti-hero and his dog should fight with the world’s most renowned agents for something so minimal and risky at the same time. Literally the Earth’s peace is depending on a salt-cellar. The path that The End of Agent W4C follows was already well accepted and successful through other earlier Czechoslovak parodies like Oldrich Lipský’s western musical Limonádový Joe aneb Koňská opera (Lemonade Joe, 1964) or Vorlíček’s previous film, superhero comedy Kdo chce zabít Jessii? (Who Wants to Kill Jessie?, 1966). All these films follow an interesting pattern. They select a famous filmic genre and then they transform it by adapting it to the Czechoslovak or even better Eastern European standards, usually by cannibalizing everything so the final result gains easily an immediate cult status. That procedure doesn’t indicate that the final result is by any means creatively inferior although the production is fairly low budgeted. Figures like Agent W4C in this case could even be pioneering for their era. We should take into consideration that James Bond franchise films were fairly new, Dr. No was released just five years prior to W4C, but 007 was at that time quite unknown to the socialist republics’ audience. That fact makes even more fascinating the work of Vorlíček and Daněk since they created an espionage parody based on an almost unknown hero from the West and this could be even more absurd than the film itself. The End of Agent W4C still holds its cult status, at least in its homeland and probably in some other countries too since it was a big hit in the USSR. For a first time viewer that it is not emotionally connected with the film, the story could be characterized as naive or even simplistic but this is not the right approach. By understanding Czechoslovakia’s political and economic situation at that time, light and easy comedies, like those by Vorlíček, were needed and necessary to conjure the darkness of the past and to appreciate that glimpses of freedom that Prague’s Spring would bring.